Donate stamps, donate rare coins, valuables and collectible items click here. Your gift can help open new vistas and provide compassionate care for the medically, educationally and developmentally challenged. Our affiliates engage in research, provide services and access equipment for special needs children. Our Wheelchair Van Donation Program enables families to receive transportation that they could not otherwise even have 'dreamt of. Please help support making this possible! Your gift can help open new vistas for special kids! Many of our kids are from communities that cannot afford the kind of one-on-one specialized care and expensive equipment necessary for them to thrive. Your generosity can benefit those who need our help the most. Join our 'special world' of kindness through your gift. You can view our affiliated beneficiaries to learn of the broad range of special needs and disabilities addressed by our charity organizations. We were highlighted by Philanthropy News Digest, Funding for Children & Youth: Resources for the Disabled and About.com as Site of the Day'. Our umbrella fund provides you with the opportunity for a charitable donation that benefits the entire spectrum of challenged youth. Donate now to be that special benefactor for our special kids! Let your gift-recipient choose the charity! Help support our special kids through this fundraising program for charitable giving! Make your commitment to 'do good' this 911 Remembrance Day – give a 911 charity donation gift. 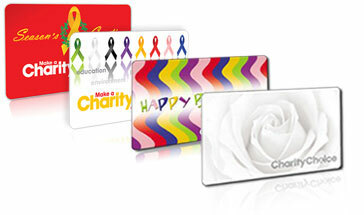 CharityChoice Gift Cards are the most meaningful holiday gifts. Redeemable, for over 1000 charities, covering; health, children, disaster relief, elderly, environment, animals and more. Let your gift-recipient select up to three charities, the causes closest to their heart, to receive funds. Buy your donation gift cards now! Have your gift cards also benefit special kids! To pre-designate 75% of the funds towards Special Kids Fund, with your gift-recipient deciding how the rest will benefit other worthwhile causes, click here.